You’ve probably heard me say that Rheumatoid Arthritis is not a hand disease – principally. So many books and websites give particular emphasis to hands in the RA diagnosis process. However, I’m wondering whether it is clear what to look for. Usually, involvement of particular hand joints such as the metacarpophalangeal joints (MCP) and proximal interphalangeal joints (PIP) is required. Many go so far as to state that involvement of the distal interphalangeal joints (DIP), next to the fingernail, is not even possible with RA. I’ve actually had a couple of rheumatologists tell me that. A few rheumatology docs also told me that my own hands were RA-free because there was not obvious swelling during the visit. By obvious I mean visible from across the room. Does it matter whether doctors or researchers really understand Rheumatoid Arthritis hands? Does it impact the way the disease is presented to the public? Could it have anything to do with the mistakes that are so frequently made with diagnosis and treatment of RA? Should we worry that there are no tests which objectively measure the activity of Rheumatoid Arthritis in hands? If you visited our RA Warrior Facebook page last week, you would have seen a post by a lady describing her recent visit to a hand specialist. She described wincing with his death grip handshake as they greeted. What upset her most, though, was that after a long consultation, he repeated the favor. Did he not hear her explanation of her pain? What was the problem? A friend of mine had surgery on one hand at Christmas. Her other hand will be done soon. She had extremely severe carpel tunnel syndrome which caused her to lose feeling in her hands for the last year. The Rheumatoid Arthritis in her wrists created nerve compression, which caused numbness and painful burning. Fortunately for her, both her rheumatologist and hand specialist recognized that RA was the cause and accelerated her treatment plan over usual carpel tunnel treatment. People frequently comment about similar symptoms. Maybe it’s more common than thought. I never even knew about it way back then, but my grandfather had his knuckles replaced when his RA hands got bad enough. Check out this fantastic page explaining knuckle replacement on Hand University. The animations are “don’t miss” if you like cool stuff like that. I sighed last week when I got an email about exercises for RA hands, advertising ways to have “limber and pain-free hands.” After I regained composure, I opened the link. The article described a technique of gently exercising every finger joint. The movements appeared harmless – if one’s RA would allow them to be performed. However, “pain free hands” with RA? Only if your Rheumatoid Arthritis hasn’t gotten to the hands yet. I’m sorry if being blunt is offensive, but exercise cannot moderate Rheumatoid Arthritis pain or damage. RA is like battery acid eating away at living tissues. People say these things because they have no clue what RA does to hands or what it feels like. The actual information in the article is pretty solid. There are even cautions about joint protection and avoiding painful movements. They just need a new headline writer. Wouldn’t it be great if an RA’er were hired to proofread some of these things? Postblog: I’ve had hands on the brain because mine hurt more than ever right now. Every joint in both hands is painful, stiff, and increasingly weak. I’ll leave off the long list I cannot do right now. I type at about 25 percent of my usual rate. I’m so glad I can type at all – at least until RA hands are clearly understood. An interesting page from an orthopedic textbook showing some RA hand issues. Exercise, exams, medicines…It’s so hard to know what the right move is. I see my hands changing before my eyes. It scares me! I’m 38 and my hands look old. The skin on the top of my hands is getting very thin – If I bump them on something it doesn’t take much for them to bleed. Part of that is winter but a big part of it is the RA. I notice daily the weakness in my hands, dropping things, not being able to put rubber bands in my girls hair for school. Can’t we just stop this monster! I bounce back and forth between my RA Doc & Orthopedic – trying to get this under control. If RA was a bit more predictable, it would be easier. Definitely read the joint protection post linked to above. That will give you a starting point for not to do. Rubber bands & things that pull are generally the worst for your hand joints because the fingers are already “loose” from the RA. The thin skin is usually from prednisone. Did /do you take that? I loved this piece–my hands are the worst. They look like a 75-year-old’s hands–much worse than those shown in the photo, and I’m only 58. The skin surrounding is fragile, as Krista’s. People often chide me about how bad my hands look. Anyway, I’m doing some exercises, but typing exacerbates it. Some days the swelling isn’t so bad, and docs think I’m “improving.” As you say, no real tests. I’ll look at the exercises you mention. Thanks for bringing up this important topic. My RA doc always checks my hands. They are in pain ALL the time. I have learned to pick up things with my arm, if my shoulders let me! Yes, the dreaded handshake. I find myself explaining away why I can’t shake hands with someone. It still seems like they don’t believe me! Oh,Kelly, I know the rubber bands are bad. I just want to be able to do my girls hair! They are only 3 & 7. It’s hard. I don’t want my kids to remember that mom never did their hair b/c of my hands when there is already so much i don’t do b/c of pain. Yes, I’ve been on pred for a while. Just got off of it. Not scolding you, Krista. Just telling the world how it is for us… I have had the same issues. I have 4 yr old boy who really loves to have mommy do lots of things. I say the same things about what he’ll remember. kelly, thanks for reading and bring up this subject. after i read it i knew i had to send it to someone who could make others aware of the dangers. i get so frustrated when people look at my hands as soon as i say i have ra, yes it’s in my hands, as my typing todat shows, but it is everywhere else too. i was on prednisone for two and half yrs. as krista the skin on my hands is paper thin, i’ve begun to wear gloves and braces always just for protection, especially to church where everyone shakes hands, they are much gentler if i’m wearing gloves and braces. anyway i just wanted to say thank-you for everything you do for all of us. God Bless. Yes, I cannot believe how hard some church people are on my hands. Everyone knows about the RA, they just don’t understand that it always hurts. If I wince, then sometimes that offends people – so I do I all can to avoid the hard painful squeeze. I pray for your RA hands everyday! I pray that the pain disappears and the movement and flexibility comes back. Your blog is such a gift and you need your hands to spread that gift. You are always in my thoughts and prayers. I didn’t feel like you were scolding me. It is just frustrating. Knowing what I need to be doing for joint preservation and actually being able to do them sometimes are two different things. I did finally talk my hubby into hiring someone to come and do all the heaving cleaning on the house to save my joints there 🙂 Gotta love that! I have them scrub showers and floors (we have lots of tile & bathrooms). Huge joint & energy saver. Hi Krista- I just want to admire the fact that you’re facing things head in. I’m sticking my head in the sand in that I DO need someone to come in and do some long,overdue deep cleaning. My poor husband has enough to do with laundry, cooking, daily cleaning. I do try to follow the techniques described in one of Kelly’s blogs about making big tasks more managable but things are just not getting accomplished. I don’t know why i’m resisting the idea of someone coming into help! I feel for you ,also, dealing with your children when you feel so crummy. I was ill a great deal of the time as my sons were growing up. Amazingly, they remember and love MOM, not an illness. I had a great deal of help from grandparents and most of all, my husband. I did try not to complain in front of my children alot but they know anyway.It’s tough when you just want to be able to do those little things. We are teaching them, by our example, one of life’s biggist lessons:how to deal with hardship and suffering. My faith played a big part as well as well as family and friend support. (so I now need to revisit that , and ask someone to come in help deep-clean! LOL At least now, I can afford to pay someone to come in once in a while. Praying you and all of us get the RA under better control! Alice- that’s a great idea about gloves/braces helping avoid those harsh handshakes at church. Thanks! KRISTA-THE FIRST STATEMNT IN MY REPLY TO YOU SHOULD HAVE READ: I wanted to let you know how much I admire the fact that you are facing things head ON-not in(DUH). sorry bout that-should have checked closer before I posted the reply! Amen to you, URandomnessK!!! Kelly is God’s gift to those of us suffering from, or should I say “blessed with”, the gift RA. Growing up, anything I ever heard about RA lead me to think and believe it ONLY affected hands, period. That is sooooo not the case. And, Kelly, just so you know, my rheumy told me the exact same thing about RA NOT affecting the joints right up next to the fingernails. What do people with RA do about the handshake thing? I was just been diagnosed with RA last week and I’ve been puzzling about that. Do I just say what’s up? (I really have no problem telling people, but it seems that it will take a lot of time and effort.) Do I just take the pain (and it does hurt, even thought the rest of me is feeling pretty good right now). Would love some suggestions about what work for others. My hands are changing too. As well as being a major source of pain along with the wrists. It’s funny someone said about people will look at their hands when you say you have RA. That has happened to me numerous times. And I’ve gotten comments on them when they are red and swollen. Shoulders have become an issue as well, just today someone jokingly hit me in the shoulder, it wasn’t hard but I reacted like I was belted. They said, I didn’t hit you that hard, and they didn’t, but it really hurt. People don’t realize it doesn’t take much to put us in pain. I was embarrassed about my reaction, so I went to talk to them after and explained that my shoulders were really bad today and the slightest hit really hurts. This person is a good friend and knows I have RA, so they understood. I felt really stupid and I couldn’t believe what a wuss I have become. Julie- Glad to be of help! It really does work. Laurie- Hi! As to the “Handshake Thing” I wear gloves and wrist braces to make people more aware, they tend to be more gentle. I do something similar. I have been planning a post about this for a LONG time. Robin- I like that, I’ll definitely have to give it a try as the gloves and braces can get hot and uncomfortable when worn for extended periods of time. Thank-You for the new “Handshake Thing” LOL…God’s Blessings! I wrote a longer reply about the same thing just below this. Sorry I did not notice your question at first. Is that a photo of your hand Kelly? It looks exactly like mine. They were the first joints affected. Right now they don’t hurt but they are a little swollen. Definite loss of strength and dexterity. I have broken most of our stemware and drop so many things. My hubby opens lids for me. Yes Jamie, it is an interesting example because my hands don’t have extreme swelling or even nodules on them. & They don’t look at all like my grandfathers’ which twisted & turned outward so far. I believe that is due to being on disease medicines before my hands were even struck. PLUS, I’ve been very careful not to do things that turn the fingers outward. Yet, the RA affected every joint in the time of 1 month about 3 1/2 yrs ago. Every joint is stiff, painful, and weak, even when not swollen or red. Still very early RA I suppose for my hands since there’s not obvious deformity. Anyway, just shows that they can be badly affected anyway. i m 17. n my ra hands hurts me a lot espcially when exams r there n i m not able to write bcoz of pain…..
Hi Kelly, my hands hurt all of the time. Fortunately my rheumatologist is very easy when examining my hands every month. I occasionally will bump one of my hands on something as I’m walking the pain almost drops me to my knees. I was surfing hand treatments a couple of months ago and ran across an ad that claimed “To Help Reverse The Debilitating Effects Of Arthritis In Your Hands, Fingers, Joints & Muscles!”. Turns out it is an open finger glove that claims to have some new material impregnated with a special patented formula of bio-ceramics that emit and reflect the healing power of far infrared rays. lol Sad thing about this is someone is probably getting rich off of this. Leslie, my swelling varies and is usually subtle enough that the doc has to press gently in order to document it for my chart. It’s more visible I think on the under side sometimes. With no nodules on my hands, I was almost embarrassed to use mine for the picture. But seeing that it can be subtle is good too. One finger has begun to turn toward the ulnar direction (toward the pinky) and some of them cannot fold down into a fist. To answer your question on swelling: It can happen in an instant. It is suddenly there. It may stay or go down. For many, medicine lessens it, but does not take it away. For me it happened at the very start of full-blown RA. The bony swelling is thought to be Osteoarthritis. But when feeling inside of joint, any extra cushiness is thought to be the RA. If you have RA, then osetoporosis & OA are more likely. I am 29 years old and was diagnosed at 20. 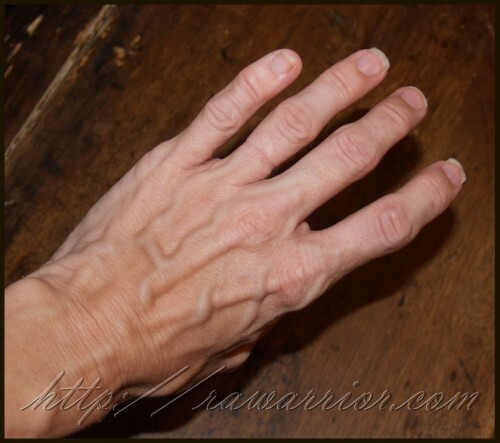 I was approx 5 years without any disease modifying medicine, my hands were the worst damaged. After about 3 years of the 5 all my fingers would no longer straighten out, they are visibly bent in a “typing” like state. The real kicker is that there was so much joint damage during that time and they hurt on and off, and now being on DMARDs for 4 years they hardly ever hurt! Which goes against what most docs say about hands? This blog is BY FAR the best RA info on the web. So much of the medical info you find out there seems like fantasy. This is the only place that describes what it’s really like. Terri, I have felt many strange sensations like that – it is not always the same. RA causes inflammation that can put pressure on nerves in odd unseen places so it does not surprise me. Some say it is ‘prickly’, some say ‘burning’, sometimes just ‘hurt’ -You are not the weirdo. Haha. I have the same thing in my toes. Just a thought, but I’ve found the keyboard on-screen on the iPad my wonderful wife bought me for Christmas is great for bad hands days. All you have to do is bump a letter on the screen to type. You could even use a knuckle! Tom – I was just thinking that yesterday while on my nook that it is so much easier to use when my hands hurt than typing. I’m a touch typer, and I find the on-screen keyboards dissatisfying (I also play piano, so it’s linked to that). But on tough days, a touch-screen keyboard is absolutely wonderful. I haven’t been diagnosed, have my second rheumy appt in a few weeks. We’ll see what happens. I drove to northern California 4 weeks ago. While there my left hand started hurting when I used my cane. Later that night my hand hurt so badly I had to get out of bed and sit with it on my lap. The next morning I could’nt close it at all, I got scared because the fingers and thumb burned and where numb to the toutch. A couple of days passed before I could grip the Wheel of my car and start the trip home. Now both hands are weak and sore, but the fingers and thumb of my left hand are still numb and weak. Should I tell my doctor or give it more time? Today while playing piano at church I fumbled over the keys several times. I’ve had pain a long time while playing but now I’m losing the ability to play. My hands aren’t swollen really at all. They are just getting clumsy because of the pain. What to do? I do not know. It is a small church and I don’t look like I should be hurting and I have probably about 10minutes of energy daily. Once I use it up I fumble through the day exhausted. Sorry. This clumsy finger thing has kind of shook me up. Thanks Kelly. Oh, I’m sorry, Jane. I wish I could do something. If you take something for pain before church, would that help? Or do u already? I remember praying it would not get my hands. And the different stages my hands have been thru. And my hands still don’t look swollen or deformed most days – but it’s still hard to slowly lose abilities. I’ll try that next week Kelly. Sometimes I do. Yesterday I didn’t. I guess I just needed to talk to someone yesteday. Thanks for listening. Oh this will sound horrible — but sometimes I want to have the appearance of my hands look like they feel on the inside so I don’t have to explain or feel bad about not being able to do what I can’t do (and every other part of the body). I probably just need to get over myself and move on. Life has been pretty challenging for the last several months and RA is just part of it. I think maybe I realize that emotional stress, the wiped-out-kind-of emotional feeling excaberates the RA in me. So, I need to keep myself centered in the Faith no matter what and my RA might do better. I wish peaceful faithful feeling had any impact on my joints. Helps me keep coping, though! Maybe that is what it is — if I am centered it is easier to cope. I think if I’m not the emotional stress will zap me of any energy I might have and when I am exhausted then the pain is hard to deal with? Or I should say Harder to deal with that is. I had almost immediate changes to my hands when I became ill with rheumatoid disease. Two of my fingers (right hand unfortunately since I am right handed) are bent sideways. My lovely rheumy (who NEVER ONCE has given me any sort of physical examination) told me that “at least your hands aren’t effected”. Say what??? You can see the distortion from across the room. I am lucky that my hands don’t really hurt, although frequently I have difficulty writing or holding things. However, my spine is killing me and xrays have shown a number of bends in my spine and I have lost some height. Oh well. Yes, rheumatoid disease is different for all of us. If this was Lupus that would be expected. A coworker of mine lost her vision temporarily, while a dear friend died withing 6 months of symptoms and I just met a young woman working full-time as a saleswoman at a department store. Just as all of them experience Lupus in different ways, so do we with Rheumatoid Disease. I just wish the public understood this – including doctors, such as the one who told me “Oh, I have arthritis too”. As far as the hand shaking goes, I’m tired of pretending it doesn’t hurt. Now I just say “Owww”. That gets the point across. The first knuckle with out a doubt is affected by RA as far as I’m concerned. It is often one of the most painful and stiffest joints for me in my hands, especially in the morning. My hands don’t look like typical RA hands. I usually don’t have any visible “swelling”, redness and no nodules. All of my knuckles are bigger now. But pain and stiffness? You bet. I have weakness that is increasing and am constantly dropping stuff.I use to love to hold my husbands hand while we walked, or sat with our hands interlaced. I can’t do that anymore. I miss it. I also have the strange sensations in my hands. Prickly is a good description. I thought it was just me and not RA related. I’m glad to hear it’s not just me and it’s not in my head. I’m sure severe deformity is in my future just by the way my mothers hands were. I wish I could find a picture and post it here to show. Her knuckles were huge at the base of her fingers, and her fingers were all facing out. But they also bent down into her palm permanantly. She couldn’t open them. ANd yet she said her hand almost never hurt her. RA is different for everyone on a daily or even hourly basis is one of the many things I’ve learned since I’ve been diagnosed 2 years ago. And Kelly, I know what you mean about all the backspacing and retyping. Frustrating! When I saw the picture of the hand, I thought, “That looks exactly like my hand!” Except for the shape of the fingernails, it could have been mine. My hands have always looked like that. Even as a child. However, I have had no symptoms of problems except for an occasional soreness in one of my fingers. Looks don’t always tell. Doctors need to know more than appearance but should always listen to the descriptions that patients give them and act accordingly. I had a flare up about 6 months ago and my hands started to become noticeably deformed, but I could still function almost as I was before. Now, my fingers on my right hand are changing quickly and they hurt like crazy. I hate taking prednisone or steroids but I wonder if it would be worth it to help with this flare up. Please let me know if with your experience you would suggest it. Thank you! I’m 30 years old and I’ve had RA for more than 5 years. I take methotrexate and I just switched from Humira to Cimzia. Unfortunately, the Cimzia has not helped yet but it has only been a little over 2 months since I started. Good luck to everyone and much love!!! Leah, have you talked to your doctors? Do you have a rheumatologist who will respond if you let him/her know what’s going on? I hate steroids too – I think most of us do – but your suspicion is right that many doctors use them to help stop a flare which could cause permanent damage. The kind of “tight control” of disease activity that they talk about in clinical trials is often achieved in part by prednisone, with careful management. Good luck to you too. Thank you so much for your reply. I wanted to get someones opinion before I call my rheumatologist about it. 🙂 I’m sure if I call they will suggest prednisone but I wanted to be sure that I was open to taking it first. I just left a message for them to call me and luckily they are usually pretty quick. Thank you!!! I love your website, as well as the comfort and support you give so many people. Comment/question: I have been experiencing debilitating pain at the base of my thumbs – where they meet the wrist. My RA dr. says it’s osteo – but bilateral? And, I have a friend who (I think) has RA, because the tips of her index fingers are completely “unhinged,” that is, they flop about without a joint to keep them in place, and usable. Is it RA, or? From the bottom of my little heart I thank you! Your passion for the truth about RA is limitless, as is my gratitude. it’s certainly possible it’s arthritis/osteoarthritis at the base of both thumbs, but I agree with you that it’s less likely if you already know you have rheumatoid and it’s bilateral. Also, the symptoms of rheum. disease are familiar to a person who lives with it, so you can tell whether those thumb/wrist joints are like the others. In just the past few months, I’ve been having trouble there too – I pick up something & expect I have a hold on it, but the thumb gives way, the object drops, and I say “owww.” For me, it is obviously the same weakness, pain, and inflammation as in the other finger & wrist joints. Also, some say that osteoarthritis can be more likely to happen in rheumatoid patients, the same way that sjogren’s syndrome and other things do, and so that would still be related to the disease – not like the arthritis in Tiger Woods’ knee or grandmother’s hip. hi. I can’t believe I am reading so many stories that is just the way I have been feeling. I found this website by typing in google,” my hands hurt so bad what can I do” I agree its a weird thing to do but I came home from work in such pain. I am a custodian and today I was stripping the floors and I had to change mops my hand just wouldn’t work there was no strength left. and it was late and I had to do so much more an I’m telling my hand to work just do it. Anyhow, when I came in from work my daughter is asking me to drop her and her friends off to a party. I was just Blah my body just hurt. I feel like no one understands an I feel like I’m whining too much I just don’t do what I used to and no one is mean but I know their thinking Why are you always tired? I get that a lot. I tell my doctor but he says its my job its labor work. No I tell him I see plenty of people working and they don’t feel this way I never did. I like working and doing a good job its the way I was brought up. Its really all I know. What do I do now? I had epidural in my lower back 3 months ago. I was told I have carpal tunnel in both hands and with mri of neck I’m scheduled for 2 shots in my neck. Oh, and I had this ball pop out below my knee well I found out that’s bursitis Whats that? I’m asking. To me its strange I’ve been telling my doctor somethings not right with me I could sleep forever if they’d let me. lol you know my family. But Sleep I don’t want to sleep my days away. I just get a look and its blamed on work kids money that’s it, its stress!! love that one!I do apologize if I’m scattered with my words but it’s just weird that I found this site. I’m asking for blood work I pray its what my dr. says it is. But on the other hand I know I’m not going crazy I know what I’m feeling. My RA began about a year ago, and I self-diagnosed it four months later when the knuckle on my left hand was very painful and red, and then a week later, my right. Now my left hand has carpel tunnel (made better with Enbrel) and I have trigger finger in my right ring finger (caused by the Enbrel). Both of my hands are in constant pain, as are my wrists also, but luckily I am right handed and it is worse in the left. I am grateful I can walk and get out and do things some people cannot, but then I would love to work on my scrapbooking or my quilting. The hands are only of my RA issues, but the most obvious and they are the first thing the doctors focus on. I have had issues with infections for the past 2 years. my hands and feet and both went to hospital.I mentioned that my hands hurt and I cant use the right one at this time. my neck getting shots my lower back which I was complaining about my hip it just does this thing an I cant walk and yes terrible pain then it goes back to where I can walk. this has only lasted minutes the longest was 25 mins. I told my dr and its my lower back that must be doing this to me. all these things are happening within 2 years and is it me don’t the dr think somethings wrong? yes but unfortunately I don’t like his answer how do I ask him to run this test for RA or am I just being a hypercondriact, sorry about spelling. My hands! I thank God for my hands always did and now I feel I’m loosing them. Last visit to the rheumy and my numbers all looked normal and he said my hands looked fine. I told him that I know people come in here with more severe disease activity, but fine? The first two knuckles on both are obviously red and swollen! After a few minutes he relented and noted the swelling on my chart. And this,was before work, where I type for eight hours a day…. I am so luckly to be able to buy a new car with reliable push button start! Easy to use controls for the stereo and cruise control, are located on steering wheel. I feel so unincumbered and “normal” driving now! The screen clearly shows what I am doing, even backing up! The car reminds me if I forget to do something! Whether my brain is sluggish or my crippled hands and painful thumbs/wrists and easy ways to bring heat and cool air for chills, I am one with my car!! With my RA, I have the typical bilateral pain, redness, stiffness, and swelling in IP and MCP jpints,but I also have a lot of pain on the palmer side of hand at MCP joints. Is this unusal? I don’t read much about that symptom.